Fineholm are delighted to offer this great example of a traditional one bedroom tenement flat with a large dining kitchen. Offered to the market part furnished ,the property is well located at Broomhill Cross, close to the local deli's , shops, and restaurants in the vicinity. The Partick retail park with M and S, Sainsbury and Boots etc. 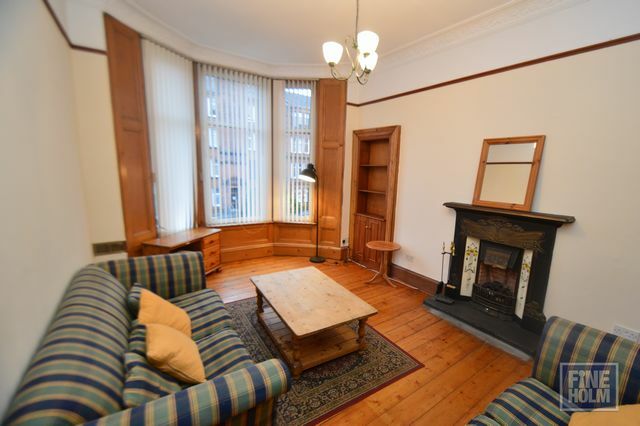 is within a short walk and for transport, Hyndland overland train station is very near. Street Parking. The flat itself is located on the preferred first floor of this well maintained block, with entrance hallway and generous storage cupboards, light and spacious dining kitchen with eating area and space to sit in the recess, bathroom with shower over bath, double bedroom and stunning living room with hardwood floors and fireplace. Freshly decorated in neutral tones throughout.